This feature presents some of the aircraft used as platforms to take the aerial photography held within the collections at NCAP. With armament replaced by cameras and fuel tanks, the Supermarine Spitfire was a formidable photographic reconnaissance aircraft and served in this role into the 1950's. Used for both high-altitude strategic and low-level tactical reconnaissance missions, much of the aerial photography held in the ACIU Collection was taken using this aircraft. Designated F-4 and F-5, photographic reconnaissance variants of the Lockheed Lightning served as the eyes of the USAAF in the European and Pacific theatres. When the standard armament was removed, various camera configurations were possible in the nose of the aircraft. Most of the US aerial photography held within the ACIU Collection was taken using this aircraft. The de Havilland Mosquito was introduced into service in 1941 to enable photographic reconnaissance of targets outwith the range of the Spitfire. Capable of flying at speeds of up to 422mph, the Mosquito could carry several camera combinations, as illustrated above. A large proportion of the aerial photography held in the ACIU Collection was taken using this aircraft. Relegated to maritime patrol and aircrew training duties during the Second World War, the Avro Anson proved to be a cheap and stable platform for post-war aerial survey work, serving with the RAF and commercial survey companies into the 1970's. Much of the aerial photography of Scotland taken during Operation REVUE (1949-1950) was flown by the Anson. Serving in the photographic reconnaissance role with 543 Squadron, the Vickers Valiant B(PR) Mk1 could carry 8 cameras mounted in a removable crate carried in the bomb bay of the aircraft. Photography flown by this aircraft features in the JARIC and DOS collections. The Handley-Page Victor B(SR) Mk2 served with 543 Squadron, RAF, in the strategic reconnaissance role. It could photograph huge areas in a single sortie by carrying up to 8 cameras mounted in a crate carried within the bomb-bay. Photography flown by this aircraft features in the JARIC and Scottish Office collections. Designed as a jet-powered replacement for the versatile Mosquito, the English Electric Canberra served with the RAF in the photographic reconnaissance role for 53 years. Much of the post-war imagery held in the JARIC Collection was captured by Canberra aircraft operating from bases around the world. The Douglas Skywarrior served as a photo reconnaissance platform with two units of the US Navy, VAP-61 and VAP-62, during the 1960's. Detachments from VAP-62 undertook aerial survey work around Europe, including a survey of the coastline of Scotland featured here. A development of the Gloster Meteor jet fighter, the photo-reconnaissance version replaced the Spitfire in this role. The aircraft mounted a forward-facing oblique camera in the nose and two vertically-mounted cameras in the fuselage. The PR Meteor was used by the RAF during the 1950's and some low-level tactical reconnaissance imagery flown by this type during Exercise CARTE BLANCHE appears here. The Hawker-Siddeley Nimrod was developed from the Comet airliner to serve in the maritime reconnaissance role. Several enlarged, 'bubble', windows in the fuselage allowed crew members using hand-held cameras to photograph ships encountered during patrols. The coverage of Rockall and the Flannan Isles featured on this website was taken from Nimrod aircraft of 120 and 201 Squadrons, flying from RAF Kinloss. Ground-crew prepare two Williamson F.52 reconnaissance cameras for fitting into a Canberra PR7 of 542 Squadron, RAF. 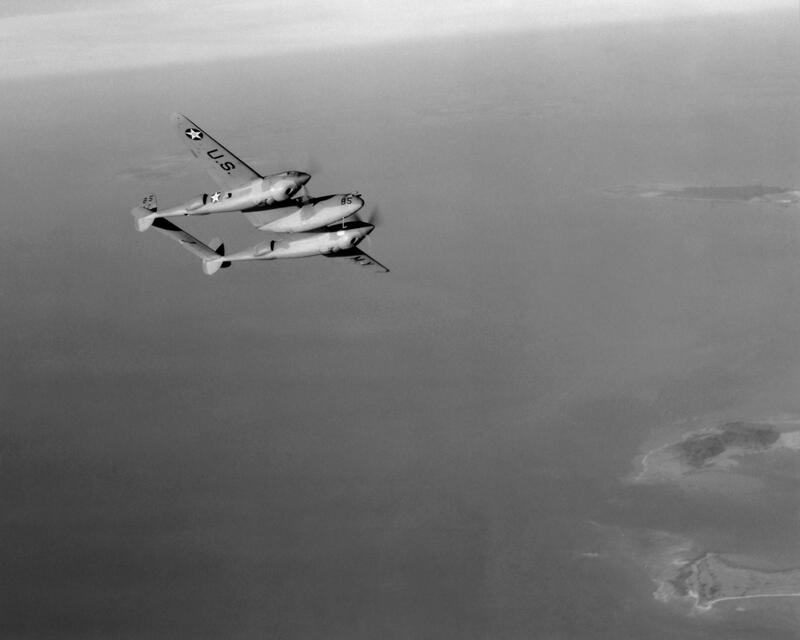 This image was taken during intensive flying trials of the type on 6 July 1954.